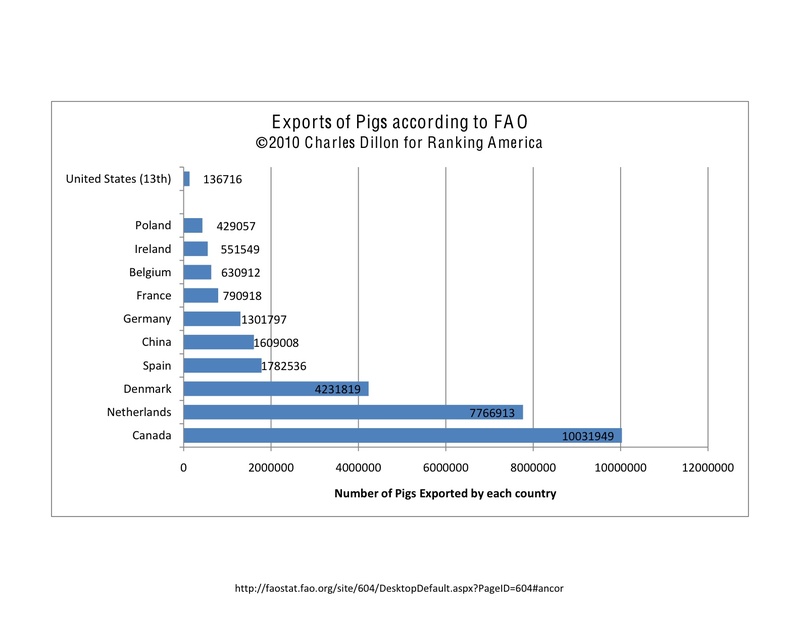 According to the Food and Agricultural Organization of the United Nations, in 2007 the United States ranked thirteenth out of sixty-three countries in the export of pigs with 136,716 heads of pigs. Canada ranked first at 10,031,949 heads of pig exported. 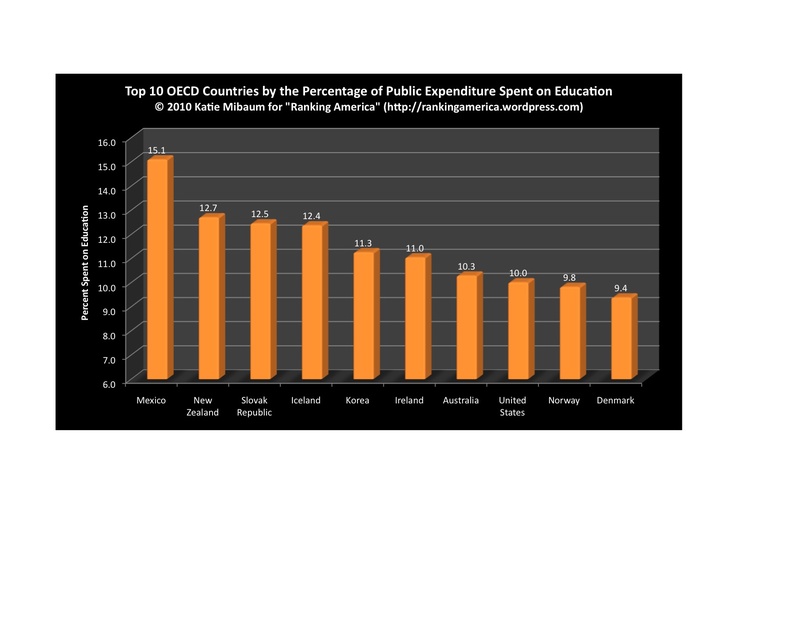 According to the OECD 10.0% of the government expenditure in the United States is spent on education, which makes the United States rank eighth out of twenty-eight ranked nations in that category. Mexico ranks first with 15.1%. According to the Organization for Economic Cooperation and Development, the United States spends $10,821 per student on secondary education, which makes the United States rank fourth in that category. Luxembourg ranks first, at $18,144. 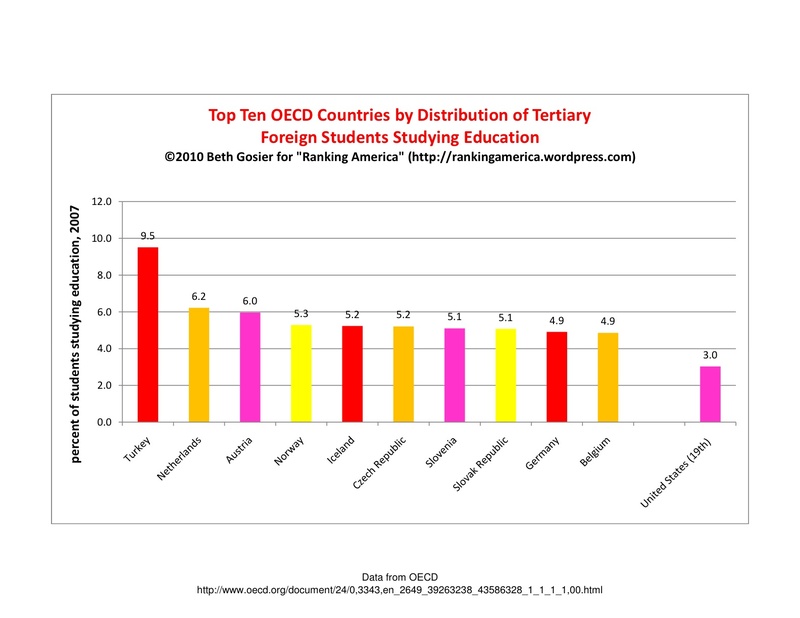 According to data compiled by the OECD in 2007, 3% of foreign college students in the United States are studying education, making the United States rank nineteenth out of twenty-seven OECD countries in that category. Turkey ranks first, with 9.5% of foreign students studying education. 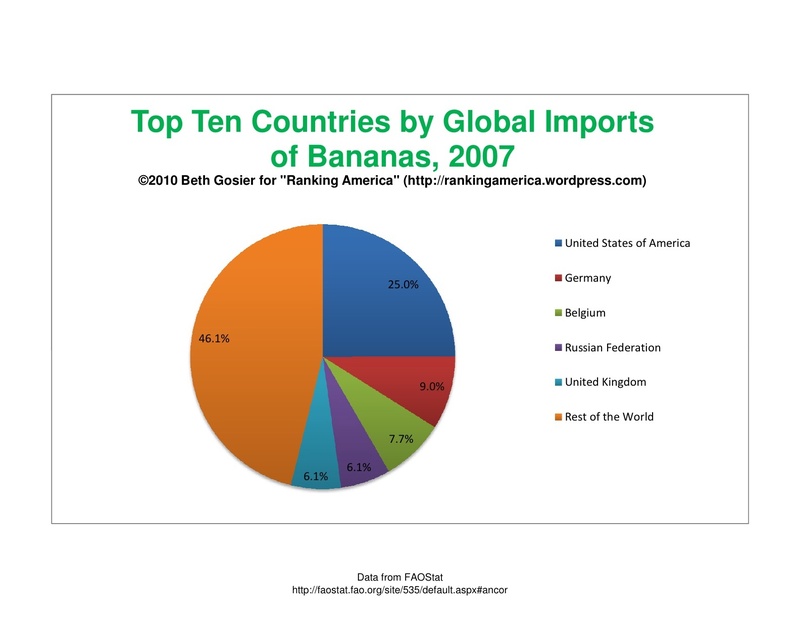 According to the Food and Agricultural Organization of the United Nations, in 2007 the United States imported 4,003,801 tonnes of bananas, or 25% of the world total. That makes the United States rank first in that category. According to FAO Stat, the United States exported 663,465 tonnes of apples in 2007. 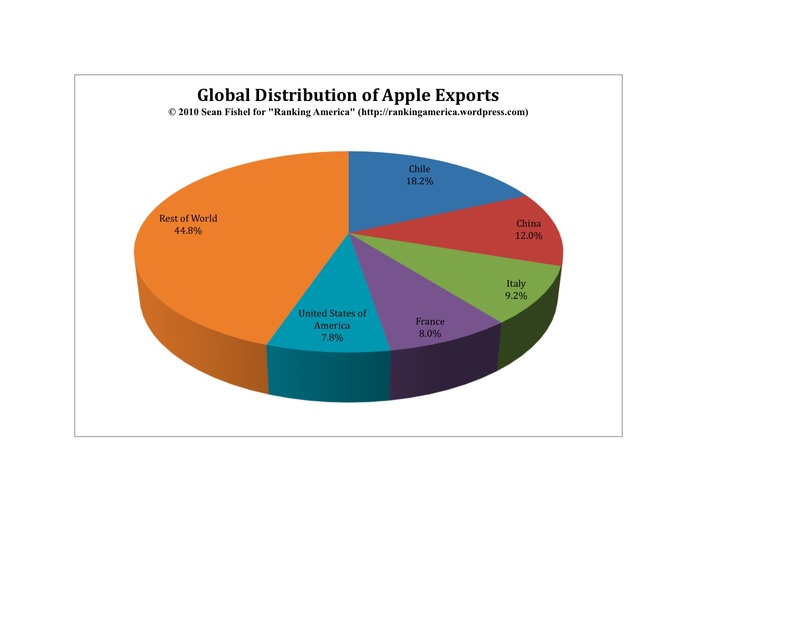 This was 7.8% of the world’s total apple exports and was enough for the United States to rank fifth in that category. Chile ranked first, exporting 1,549,269 tonnes of apples or 18.2% of the total world exports. According to the CIA World Factbook, the United States has 13,769 radio stations, which makes the United States rank first in this category. 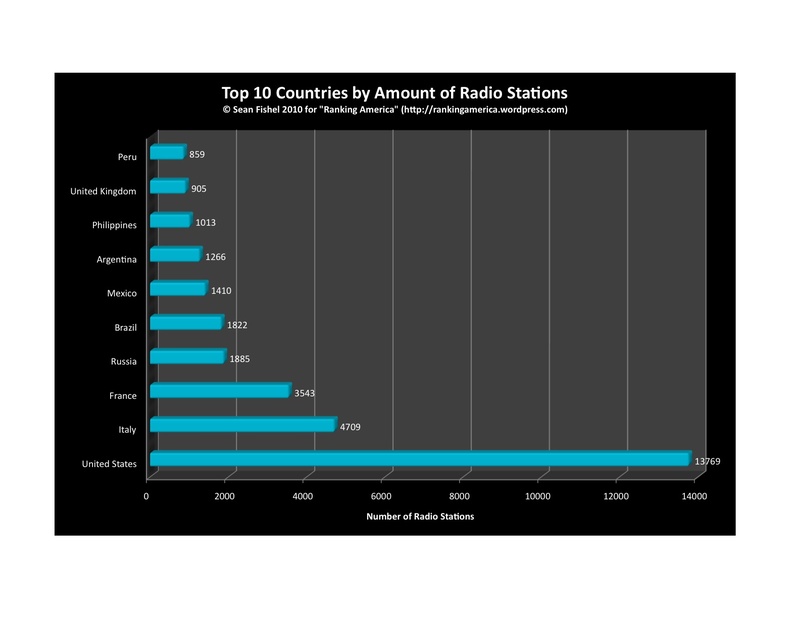 There are 50,839 total radio stations in the world. Entry prepared by Sean Fishel.